What is the first company that comes to mind when you think of non-toxic cleaning? For me personally it is Seventh Generation. As far as I can remember, it seems like they were always there. At least back when people started being concerned about cleaning with toxic and carcinogenic substances. Hey, our grandparents and ancestors all cleaned with vinegar, baking soda, lemon juice, and other natural methods... Then 'advances in technology' came about and our homes were flooded with chemicals. While I am pretty handy with homemade cleaners, what mom has the time for that? Besides, Seventh Generation products are quite affordable. Just a little more than from scratch. The best thing though is that these green cleaners actually work! I used to dislike cleaning just because of the toxic smell associated with it. Now I have no excuse! 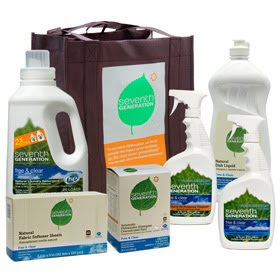 Seventh Generation was kind to let us try their Free & Clear Starter Kit which includes the Glass & Surface Cleaner, All Purpose Cleaner, Dish Liquid, Laundry Detergent, Fabric Softener, Automatic Dishwasher Detergent Pacs, Natural Paper Towels, and a Reusable Tote. We haven't had a chance to try all of the products yet, but we're loving the ones we did so far! My favorite is the All Purpose Cleaner simple because of the all purpose part. It is nice to have just that one bottle to clean anything and everything. I actually tried it on my glass cook top that was heavily used the night before. It had dried up spills and spots everywhere. I sprayed the entire surface and wiped it with a cloth. Everything came off beautifully, as if it was spilled two seconds ago - not 12 hours. No fumes or toxic smells, no weird colors, just a powerful way to clean. Since I do not use a dishwasher, I gave the Automatic Dishwasher Detergent Pacs to my mother. A week later I saw her again and asked her if she tried the packets. She said "Oh yes, I did. They work so well! I used to get streaks on my dishes all the time, but with this thing they came out clear and sparkling, no residue. It seemed like even the dishwasher is cleaner now - but maybe that's my imagination!" So to put it simply, I love that their products work and that they are so readily available. Have you noticed their new Protecting Planet Home commercial airing on TV? I certainly did. Great to see green going mainstream! 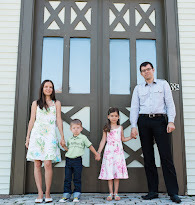 MANDATORY ENTRY: Go to the Seventh Generation website and tell us in a comment which of their last 10 blog posts is your favorite (hint: under Learn in the top menu). You can also become an Eco-Babyz or Seventh Generation fan on Facebook, but this will not count toward an entry because of new Facebook Promotion Guidelines. Contest ends at 11:59pm EST on Tuesday, March 9th. The winner will be selected using Random.org on Wednesday March 10th and notified by email (make sure I have a way to get in touch with you!). Open to US residents. Thank you! I make my own all-purpose cleaner using water, vinegar, dish soap, tea tree oil, lavender oil and alcohol. My question is - is using alcohol a good idea or a bad idea? I like the blog about what vegans eat because I am considering becoming one. My favorite product is their paper towels. I can clean the bathroom no problem, but I couldn't even begin to tackle dishes without the music blasting! Just remember to take stretch breaks if you're on your knees scrubbing the floors. :) I'm considering a gardener's kneeling pad, too! Being that I have a baby due in May and a 20 month old at home, I am loving the Lower Diaper Pricing is Here! blog entry. I was drawn to 'big green lies'. Google connect friend follower kycouple2000. Following ecoblogz on twitter as ky2here1. Following seventh generation on twitter as ky2here1. My favorite product is the 100% recycled facial tissue. I like the Teach Your Children Empathy post. I feel that this is sadly lacking in today's society. I use their Natural All Purpose Cleaner. It works great and leaves a clean fresh scent. I was shocked to learn that of the 80,000 synthetic, man made chemicals only 200 are safety tested. That is ridiculous! My favorite 7th Generation product is the laundry soap. My husband and son are both have skin sensitivities, and it works well for them. I already subscribe to the 7th Generation newsletter. My favorite is Teach Your Children Empathy. I know my children really hate to see anything killed even if it is an insect (not counting spiders). They all don't mind the spiders outside but do not want them inside..I think it is good for children to know what good an insect can do for our planet and their place here. I would love to try their free and clear detergent. I liked The Conscious Kitchen. Thanks! Such a tough decision! I believe my favorite is the The Conscious Kitchen post. Tough decision! I believe I would most like to try the Delicate Care Laundry Detergent. Entry #1 --> I signed up for the Seventh Generation newsletter. Entry #2 --> I signed up for the Seventh Generation newsletter. Entry #1 --> I joined the Seventh Generation nation. Entry #2 --> I joined the Seventh Generation nation. I am following you on Twitter (username Nelsby). I am following @SeventhGen on Twitter (username Nelsby). Entry #1 --> I subscribe to your blog's RSS feed. Entry #2 --> I subscribe to your blog's RSS feed. I like "What do vegans eat"
My favorite is the Blog on corporate responsibility. This is so important so I am glad that someone has it on their heart. My favorite is Tell Congress to Protect Planet Home with Action on Worst Chemicals. My favorite product is the recycled trash bags. I like the post, "What Do Vegans Eat?" "Teach Your Children Empathy" - and I can't stress it enough! Great post! My favorite product is any of the recycled paper and supplies, I feel so wasteful buying them (not recycled), but I am more dependent on them than I'd like to be. :) So these products are perfect! I like the "What Do Vegans Eat?" post. The Lavender Floral and Mint Dish Washing Liquid is my favorite! I liked the post about diaper pricing. I like the article "Tell Congress to Protect Planet Home With Action On Worst Chemicals". I like that Seventh Generation so pro active. I like the Shower Cleaner — Green Mandarin & Leaf. I follow with google friends connect. My favorite product is there Laundry soap the clothes always come out with the cleanest and freshest scent. I use the Free and fragrance free dye free laundry detergent. I like the "Sleep Tight" post - because I'm having some challenges in that area right now and got some good ideas! I liked the article about The Conscious Kitchen, which I now have to go out and buy! I already subscribe to the Seventh Geeration Newsletter. I am currently loving the Seventh Generation laundry detergent with eucalyptus. I also used the dishwasher tablets once, but haven't been able to find them since! My favorite post is "Teach Your Children Empathy"
My favorite product is the the dishwasher packets. We've used them for months and they work fab! I love "teach your child empathy." My favorite 7th gen product is the dishwashing soap (liquid). I follow your blog on google friend connect. I like "Teach Your Children Empathy." I enjoyed the "creating-game-plan-transition-sustainable-economy" blog on 7th Generation's site. We use/like the Natural Dish Liquid from 7th generation. thanks for the chance to win! i love Seventh Generation products. My favorite product is the Natural all purpose cleaner. i also love the dish soap, which i buy and use regularly. i subscribed to the Seventh generation Newsletter. i'm a member of the Seventh Generation Nation. i'm subscribed to your RSS via Google reader! Well, I haven't used them yet, but my guess would be the bath and tile cleaner. I am following your blog now through google connect. My fav. 7th Gen product is the free & clear line fabric softener sheets. I liked "Teach Your Children Empathy" on the 7G blog. I get 7th gen. newsletter. Already get the 7th gen. newsletter. I love them. I follow 7th gen. on twitter. Already part of "the nation" on 7th gen. website. Already a part of "the nation" on 7th gen. website. I agree with the "Teach Your Children Empathy" post. I'm working on that with my son. My favorite is The Conscious Kitchen. Thanks. I appreciate the posting on sleep! My favorite article was about the heirloom seeds producing more nutritious produce than hybrid seeds. My favorite product is the powdered laundry detergent. From SEventh Generation, I liked Sleep Tight. Public Google Friends follower as jennem. my comments are still not coming up, so i'm not sure i've done all the entries. Pretty sure i haven't tweeted yet, so here is my tweet. I liked the post Choosing Heirloom Seeds - Reaping What You Sow! I am signed up for the Nation. My favorite Seventh Generation product is the Lavender scented Natural Dish Liquid. It would have to say the "Sleep Tight" blog is my fave. I could always use some tips on getting a better sleep. I liked the "Teach your children empathy" blog post best. It resonates with me... I refuse to kill spiders (though I will relocate them to the outside world) and hope my son will have the same respect for life as he grows up. My favorite product is the first one I tried when I discovered Seventh Generation: Natural Dish Liquid. I am following Eco-Babyz via Google Friend Connect. i like teach your children empathy! I love the all purpose cleaner. Use it every day in my kitchen. I love the heirloom seed story. What a neat old idea on growing things! I love the Lower Diaper Pricing is Here blog post. My favorite is Teach Your Children Empathy. If we would teach our children empathy there would be no school shootings. I love Seventh Generation's free and clear dishwasher detergent (the powdered kind). I like: 9 Easy Steps to Green your Home Office! Actually, the tips could also be applied to other areas of the home as well! My favorite Seventh Generation product is the Chlorine free bleach! I think the Choosing Heirloom Seeds was the most interesting to me. We're doing our first garden this year and I need to learn all I can! Lower diaper pricing is here. I would really like seventh generation dish washing soap. I like the blog post about teaching your child empathy. My green Heroine was good to read.